The top line of the 32nd-seeded ’84-’85 Winnipeg Jets exploded yet again. Last year, all three were among the Ultimate NHL Playoff’s top scorers and they’re likely headed there again. Meanwhile, the 33rd-seeded ’37-’38 New York Americans did pose a bit of a threat, but continue to have just a single game win in their three UNP appearances. Paul MacLean, known more nowadays as the only walrus to coach in the National Hockey League, was Winnipeg’s top scorer with 14 points over the four games. Dale Hawerchuk was right behind him with 13 points while the final member of that top line, Brian Mullen, was third in overall scoring with 10 points. Hawerchuk lead the Jets in goal-scoring with seven genos while the walrus was a close second with six. Thomas Steen was the third and final member of the team to average at least a goal per game with his four goals in the series. MacLean and Mullen were tied for the team lead in helpers with eight apiece. Hawerchuk, of course, was second with six assists. Randy Carlyle was Winnipeg’s biggest offensive contributer from the blue line with a goal and four assists for five points. Goaltender Brian Hayward was a little busier than I would’ve expected, but ended with a solid series. He posted a 4-0-0 record with a 3.00 goals against average and a .921 save percentage. The Americans have threatened a bit over the last two UNP’s, including their only game win last year. On average, they were outshot by seven over the series, but were more than doubled up in goals. Lorne Carr was both the Americans’ top goal-scorer and top overall scorer. He scored six goals and added an assist for a total of seven points, including a three-goal and four-point effort in Game 3. Nels Stewart was second in goal-scoring with two goals. Art Chapman was second in scoring with five points, all of which were assists, a team high. Hooley Smith and Sweeney Schriner were tied for second in assists with three apiece. John Gallagher was New York’s highest scoring defenseman with a goal and two assists for three points. Goaltender Jake Forbes was under a lot of pressue all series and his numbers reflected it. He finished with an 0-4-0 record with a 6.50 goals against average and an .856 save percentage. 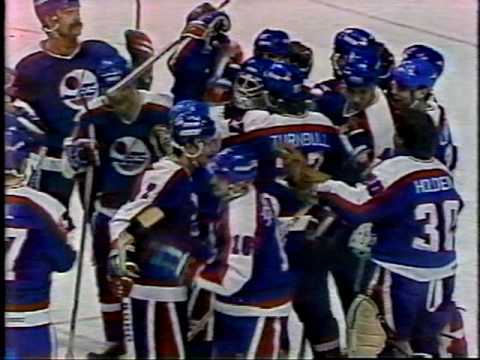 The ’84-’85 Jets are in their third UNP and have advanced out of the First Round for the second year in a row. They have a very tough test coming in the Second Round as they will face the top-seeded ’76-’77 Montreal Canadiens, winners of the inaugural UNP. Meanwhile, the ’37-’38 Americans continue to look for their first series win. Despite the sweep, they were in all but one of these four games. Next up in the First Round, the 24th-seeded ’84-’85 Washington Capitals face the 41st-seeded ’15-’16 Winnipeg Jets! This entry was posted in 1st Round, Ultimate NHL Playoff and tagged Art Chapman, Brian Hayward, Brian Mullen, Dale Hawerchuk, First Round, Hooley Smith, Jake Forbes, John Gallagher, Lorne Carr, Nels Stewart, New York Americans, Paul MacLean, Randy Carlyle, Sweeney Schriner, Thomas Steen, Ultimate NHL Playoff, Winnipeg Jets. Bookmark the permalink.